One of the best products to hit the world of Underwater Photography in a long time is the Sealife Digital Pro Flash. With digital photography revolutionizing the way we take pictures both above and below the water, it?s never been easier for the diver to take high quality photos of the things we experience underwater. Digital cameras and the housings for them are very reasonably priced, and better yet, since we?ve also eliminated the need for expensive processing to get just one or two decent shots out of a dive it?s turned from an elite specialty, reserved for those with deep pockets to buy the equipment and process the images, into one that just about any diver who can afford their own personal gear package can enjoy! With a very reasonable budget you can afford to shoot underwater images like a pro! 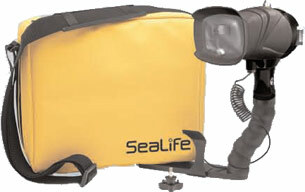 With this change also came the Sealife Digital Pro Flash. Using a fiber-optic cable to capture the light from the camera?s internal flash and deliver it almost instantly to the sensor on the strobe head Sealife has eliminated the need for finicky electronic connections that only serve to limit the usefulness of the strobe. With this set up the same strobe can be used on virtually any digital camera! The tray has a standard mount that screws into the bottom of any housing equipped with a tripod mount as well as an adjustable slot that allows for the tray to be properly positioned and secured. The arm is a flexible ball joint style design that allows the diver to position the flash anywhere they like to get the effect they need for their shot no matter if it is simple daytime color correcting or bringing daylight like illumination to a night dive. The fiber-optic cable comes in doubly handy here, ensuring the flash firing with every shot, regardless of the angle of the sensor to the camera. This system also serves to eliminate mis-fires caused by the flash of another diver?s strobe going off being captured by your strobe. The back of the strobe has 5 pre-flash settings and an easy to see indicator light so you know when it?s ready to shoot again. It is powered by 4 AA batteries and personally I?ve found the new fast charging rechargeable batteries to work fantastic with the flash. With a functional range of 2-8 feet and a working depth of 200ft. it?s a safe bet that the strobe will be ready for you no matter what the environment you are shooting in! While you may go through several cameras over a period of time as technology races to beat itself, it?s a pretty safe bet that this strobe will out live them all!